Customized Clean Bottle. Yours Right On-line. Order one or hundreds. Clean Bottle. Advantages of a Personalized Square Design. A personalized clean bottle makes a great wedding gift or other special occasion. Design your own right on line or forward your artwork to us. We’ll be glad to help. Corporate logos are very popular items as are your favorite quotes and pictures of wedding parties. Special birthday? Why not make it a special gift? 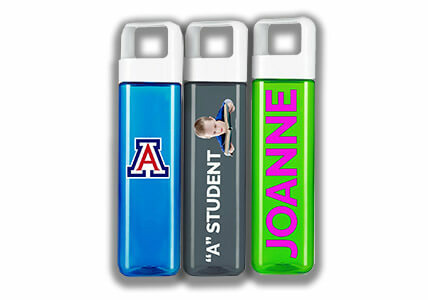 Remember there are no minimums or set-up charges from Graphic Impact for your customized drinking bottle. This is a truly unique gift that is sure to be a big hit!